Some people dismiss Indian art films as ponderous and boring. I'm usually an enthusiastic cheerleader for art cinema - the more variety of films available the better. If I wanted to convince a mainstream film-lover that art films weren't ponderous, though, Ek doctor ki maut ("Death of a doctor") would not be the place to start. This tale of a maverick scientist going up against the establishment just falls flat. Dipankar Roy (Pankaj Kapur) is a physician who practices in a government hospital. He's not that interested in clinical medicine, though - his passion is his research on a vaccine for leprosy. He works into the wee hours - to the chagrin of his long-suffering wife Seema (Shabana Azmi) - in a tiny makeshift lab in his home. Huddled amongst the caged lab animals, dusty reference volumes, and burbling beakers, Roy toils away night after night, his work punctuated by verbal sparring matches with Seema. One day he has a breakthrough - he has discovered that females inoculated with his compound give birth to offspring immune to leprosy, and what's more, the compound has a secondary effect of reversing certain kinds of sterility in females. His results are published by an eager science reporter (Irrfan Khan), but the reception in the scientific community is chillier than Roy anticipated. Specialists in leprosy are skeptical of his findings, and gynecologists are incensed by his speculation that the compound may treat sterility. Instead of getting a fair hearing for his work, Roy is shut down by his superiors in the health ministry, cut off from his work, forbidden to share it with the international medical community, and transferred to a remote village. That sounds like a pretty good story, and having summarized it just now I am struggling to understand why the film in execution is so gratingly dull. Part of the problem lies in script and direction. The film is shot in a hyper-realistic, hyper-literal style; there is no artistic camera work, no symbolism, nothing to layer the dialogue or add depth or allegory to the events unfolding on the screen. It is more like reading a newspaper article than watching a piece of cinematic art. And, like a newspaper article, Ek doctor ki maut presents its events in words - Roy explains his results to his friends; Seema orates her frustrations with her marriage, puts her threat to leave Roy in a letter, and then expounds, in words, on why she decides to stay. 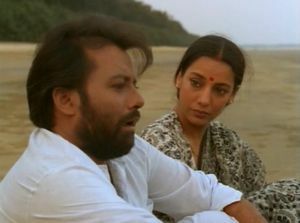 All the verbiage smothers the lovely, subtle performances of both Pankaj Kapur and Shabana Azmi, the latter especially; she seems to want to show Seema's conflict in body language in the kind of performance that she can give better than anyone, but the script won't let her stop talking long enough to do it. Stylistic matters aside, as a former scientist, I was nonplussed by the film's treatment of the process of scientific discovery and review. In the U.S., when scientists choose to present their work via the press rather than in a peer-reviewed publication, they frequently meet with a skeptical response - not without reason, as illustrated by Fleischmann and Pons's now infamous announcement of cold fusion. So I don't perceive any great injustice in the response in the medical community's circumspect reaction to Roy's self-published results. This leaves me somewhat at a loss to interpret the message of Ek doctor ki maut. Perhaps the practice of scientific research is different in India from my own experience, so that in the film's context it's clearer just what is being criticized. To my eye, though, other researchers are justified in viewing Roy with some suspicion; he appears to be more eccentric than not, puttering in a makeshift homemade laboratory, forgoing peer review, and lashing out in anger at any who dare challenge him. Ek doctor ki maut is not all bad; I've mentioned the delicacy of the actors' performances, and there were a few excellent moments shining in the film's bland substrate. In one excellent sequence, Roy steals Seema's sterno cooker out from under her when he runs out of propane for his Bunsen burner; later, he predictably scolds her for failing to cook his dinner, and the skirmish is a poignant microcosm of their entire relationship. And in the closest thing to a character arc there is in the film, Roy later demonstrates a growing awareness of his reliance on Seema and her need for some reciprocation. This is best shown in several tender interactions between them, one during her visit after his exile to village practice, and another in the film's final scene. If the rest of the film had been handled as delicately, Ek doctor ki maut might have felt less like two hours of squandered potential.